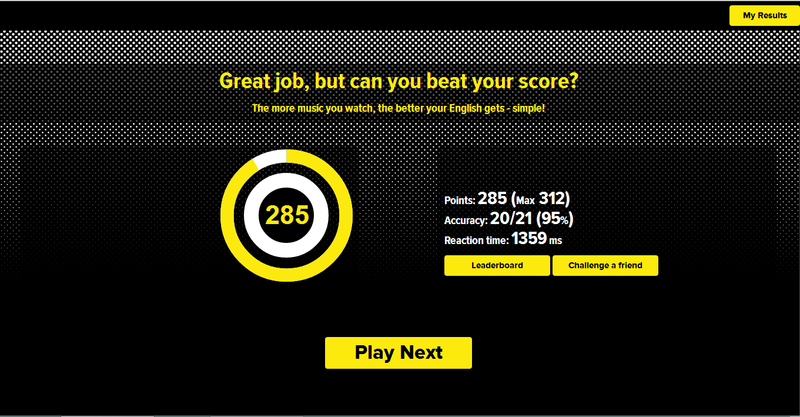 ReBeats is an online game that aims to improve English language learning through listening to music. 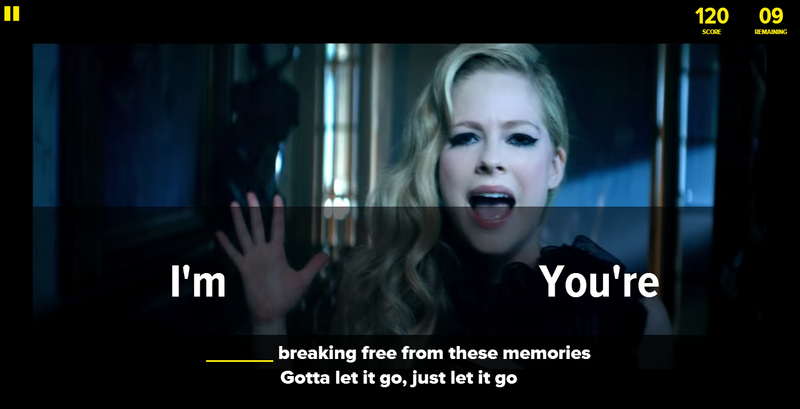 Using a simple fill in the gaps format, users watch a music video and select the correct word from two options to complete the lyrics of the song. Scores are awarded for choosing correctly, speed and streaks of correct answers. Users can then enter a leader board or send a challenge to a friend’s email address. At the moment the website is still in its early stages of development and they are asking for feedback. I decided to give the website a test run, looking at its potential as a fun resource to be used in the classroom with students. The website is very simple with minimal instructions but it all becomes self explanatory very quickly. You have the choice of using the mouse of the left/right buttons on the keyboard to choose the correct word. The latter is a lot quicker. I would like to try it out on an interactive whiteboard, with students taking it in turn to be in control of the ‘magic’ pen (watch this space). Students left to watch can shout out suggestions or sing along, karaoke style. I would be singing regardless. One missing feature that I immediately picked up on is that you are unable to select the song. They are currently randomly generated, meaning that you don’t know if Miley Cyrus’ Wrecking Ball video might pop up next to your class of 9 year old girls, or if the vocabulary in the next song might be too easy/hard for the group. A representative from ReBeats has assured me that this is all due to the site still being in development and hinted at song choice and making your own playlists as developments in the near future. An even bigger improvement could be to rank songs from easy through to hard, based on the language used. The word choices offered give a good range of easily confused words, homophones (words that sound the same but have different meanings/spellings), context specific choices and basic grammar rules. Sometimes either word could be correct, requiring students to use their listening skills. There is only one word missing for every few lines of the song and if a song is particularly high tempo or the class are struggling to choose the correct word there is the option to pause the video and go through the sentence with the students. At the end of each game, points, accuracy percentage and reaction times are displayed, with the option to add this to a leader board or challenge a friend via email. My students love competition so the fact that there are points and rankings is very important when trying to keep them engaged. End of game points review. 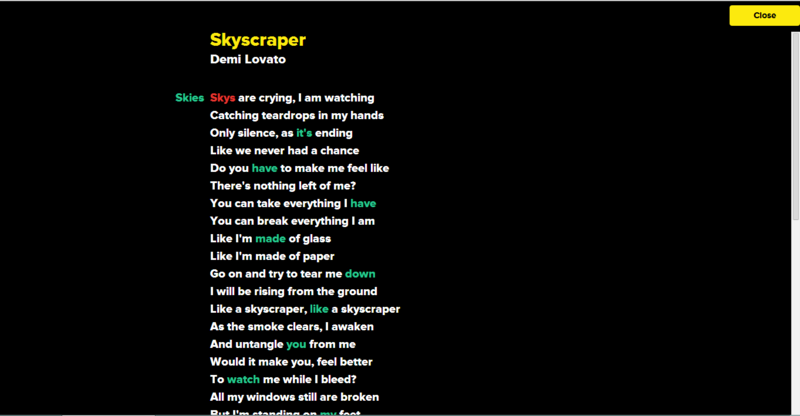 Also, once a song is completed you have the option to review all of the lyrics with the correct answers revealed. This could be a great time to discuss why certain words wouldn’t work in certain sentences and to review any incorrect answers made. You can review incorrect answers at the end of each game. During the time that I played, I had songs from artists ranging from Kings of Leon, Queen and Avril Lavigne to Olly Murs, Adele and Lana Del Rey. Most of the songs are current and ‘cool’ enough to keep my students happy. Overall I think it’s a good resource to use in the classroom as a bit of fun at the end of the lesson. Personally I don’t think this is a tool for serious language learning, although the team at ReBeats are promoting it as a potential resource for making real improvements in English language learning. The site has a slick, app-like appearance and is ad free. As it’s currently in the beta stages of development, expect further feature and game play developments to appear in the not too distant future. I will definitely be checking back to see what improvements are made as they receive feedback. All reviews on this blog are my personal and honest review. 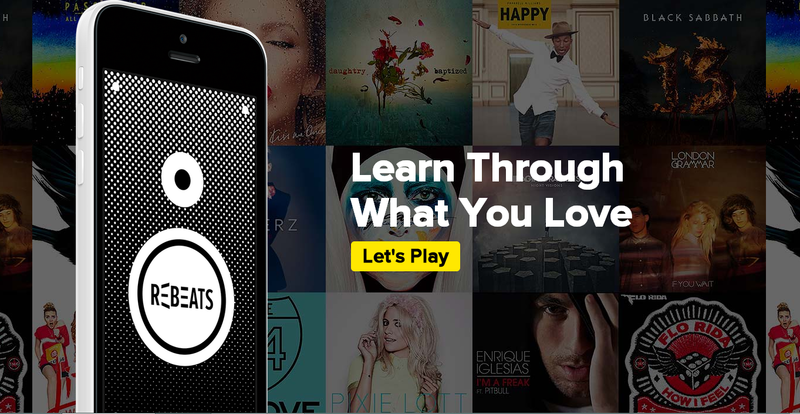 ReBeats is a product from Tonguesten, an education technology start-up based in London and currently incubated by Wayra UK and UnLtd. I did not receive any payment, monetary or otherwise, to write this review. If you have a product you would like me to review please get in touch – info@cornishkylie.com . It is part and parcel of the TEFL experience to take part in a school camp. Sometimes over a weekend, usually involving some sort of overnight aspect and almost always never actually involving any actual camping, the school camp is a great opportunity to get to know your students outside of the classroom and have some fun. The school camp will often involve bringing together different groups of students who wouldn’t normally study or socialise together. We’ve all been in those situations where we are thrust into unnatural groups and forced to take part in activities and the beginning stages of shyness and awkwardness are magnified when those being thrown together are Thai teenagers. Cue a not-too-challenging, on topic ice breaker! I made this activity to open a school camp for Matthayom 1 students who I knew already had the basic vocabulary knowledge needed to complete the activity. Students are required to match pictures and words of a range of items and then sort the items into ‘pack’ and ‘not pack’ . The activity can be introduced by saying that we are all getting ready to go on a school camp but firstly we need to pack our bags. Students can work in small groups or against the clock, with the teacher reviewing the answers at the end and awarding a winner. Click here to download the picture and word cards. Simply print and laminate if you can – now you have your very own go-to camp warm up activity! It’s just something nice and simple to get students talking and thinking. You could also use this activity in the classroom if you were studying topics such as going on vacation, clothing or as a general activity for more advanced students.